Steiff National Geographic Bongo Dangling Gibbon is made by hand, in the finest blond tipped cuddly soft plush. The National Geographic Bongo dangling gibbon is 46 cm tall. This species is on the Red List of Threatened Species and is at risk of extinction. The gibbon lives in the Asian rain forests along with his mate and usually two to three children. When swinging from tree to tree, gibbons can clear a distance up to twelve meters in one jump. The primary reasons why they are dying out include the following: Destruction of their habitat, poaching and illegal trade. 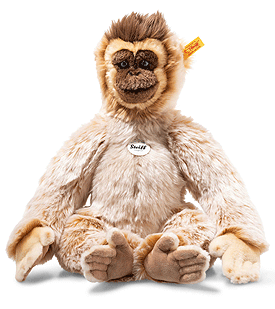 This gibbon here is made of soft and cuddly plush fabric with blond tips. His face and chin are dark brown. His inner ears and sides of his face stand out for their light brown tone. A dark brown plush fabric with long strands adds some fun to the head. His soles are beige. The gibbon's belly, the backs of his hands and the top of his feet are cream-coloured. A black airbrush was used to create the nostrils, mouth and eyes and make them stand out. Brown has been used around his face and for his fingernails. The areas where his paws connect to his limbs also feature brown shading. This cute, lovable friend will remind children of the beauty of the animal kingdom and makes for an exotic-looking playmate.